Alan was born and raised in a military family. He started his printing career in Rapid City at 16 years of age and opened his first shop in Casper, WY, when he was 19. 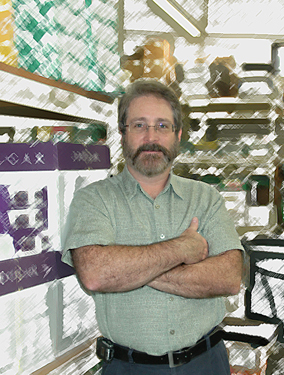 In 1982, Alan returned to Rapid City and took over operations of The Little Print Shop. Alan has a hands-on style of management and enjoys working in all the departments of the shop along side his co-workers. Alan is a charter member and past President of The Exchange Club of Rapid City, and currently serves as Director of the Flag Display Program. He is a charter member of The National Association of Quick Printers/Print image International, a member of The Rapid City Chamber of Commerce, and the U.S. Chamber of Commerce. He sits on the Board of Directors of Printing Industries of the Midlands which is an affiliate of Printing Industries of America and the Graphic Arts Technical Foundation. In 1984 Alan married and now he and Marilyn have two boys and two girls. Alan enjoys searching for fossils, rocks, and minerals. Backpacking, fishing, and family camping are favorites during the summer, along with snow skiing and snowmobiling during the long winters. He also enjoys throwing darts competitively. During the riding season he enjoys cruising on his Harley through the Black Hills.